I personally operate a wireless ISP in an area that has no other type of conventional high-speed internet conection (ie. cable, fibre or DSL). Not having access to fibre myself, I am in a situation where the single fastest backbone connection I can get does not provide enough bandwidth for me to have only one connection. As a result of this limitation load-balancing multiple internet backbone connections is very important. Before you even log onto your RouterOS box, you should have an idea of how you want to divide your traffic, and have an understanding of what traffic can and what traffic can't be broken up. After making a list of the traffic type, and the ports they operate on, you need to look at the list and decide if it is at all even capable of being forced out a certain internet connection. Now for a quick explanation of why there can be some issues depending on the traffic type. Some websites/programs do not play friendly with multiple requests from different IP addresses, this is the reason why ECMP has so many problems. I will provide a simple solution to the rare conditions where load-balancing can't be completed. Again using the above as an example lets explain where and why issues can be arise. SSL - The beauty of a website is that are separate requests for different data, ie. loading pictures from 3 different sources would be a request to each respective server. The result is if a we have a website that uses both SSL and HTTP traffic we know that in most cases the website will just answer the request without care of the originating IP address. However, and this is a special case, if the website/program developer checks where the requests are originating and they find that the IP are different, they may not succesfully answer those requests (this can be by design or by accident). I had 2 cases of this, in both cases it was secured medical websites that where using it as a method of protecting their data. Before we get to the real point of this tutorial we need a fictious network we can use as an example. Asuming that the IPs, default routes, and DNS settings are already in place the following allow users to get internet access. The first two lines provide a method of marking certain clients to bypass the load-balancing and use only a specific internet connection for all of their traffic. The next lines then will mark traffic based on the dst-port, notice how we are not passing through, also notice that we are marking all traffic, even if not known and that there is always a different internet connection to be specified for the Unknown and P2P instead of using the router's default route. I also mark P2P separate, even though it must go out the same internet connection as Unknown traffic. 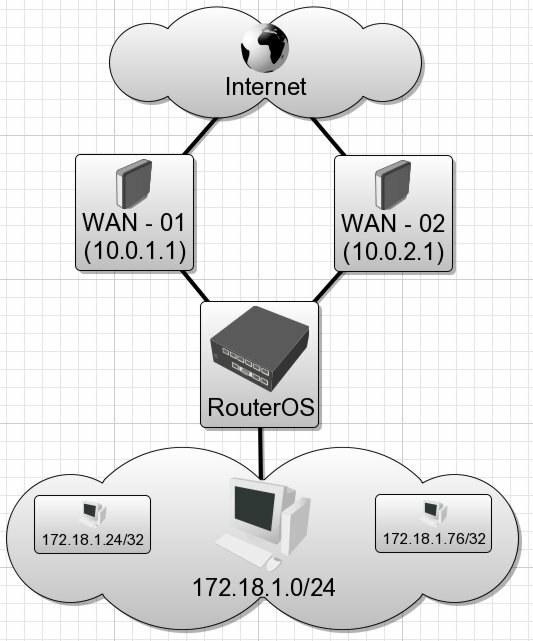 I do this for a couple of reasons, one is that I could easily stop all traffic by simply disabling a route, and the other is in my RouterOS configuration I use a lot of QoS, it's very easy to remember how everything is configured if the QoS mirrors the load-balancing. So now that we are marking traffic for their respective routes, we next have to add those actual routes.